ANAHEIM, Calif. -- Daniel Sprong didn't waste time making a positive first impression on the Anaheim Ducks. The teams have split their two games this season. Their last meeting will be Feb. 27 in Anaheim. ... Kase, who has a point in seven of the last eight games, has eight career game-winning goals. ... Anaheim C Adam Henrique extended his points streak to six straight games with an assist on Sprong's goal. He has a goal and five assists in that span. ... RW Pontus Aberg has three goals and two assists in the last three games. ... DeBrincat has eight points (four goals, four assists) in five appearances against the Ducks. 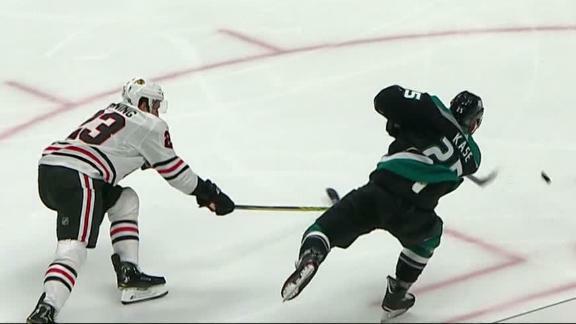 Ondrej Kase snaps a wrist shot over Corey Crawford's shoulder to give the Ducks a 3-2 lead over the Blackhawks early in the 3rd period.